I almost completely forgot about Halloween this year. I went to work and ate a pumpkin spice cupcake. I laughed when Jimmy joked about wearing my face for Halloween and that was pretty much it. Come to find out that someone DID wear my face for Halloween. I'd emailed Lisa London in Florida to tell her that I was totally into the excel spreadsheet I'd made and was therefore thinking of her. When she was my boss at The Feminist Press and I witnessed her getting excited about spreadsheets, I used to suspect that she had issues. Now that I'm that person, I'm sure I'm FINE. She answered my email and agreed that spreadsheets are hot. We didn't really go into details but I'm thinking of letting the next guy who shows me the formula for adding number columns get to second base. Or third. 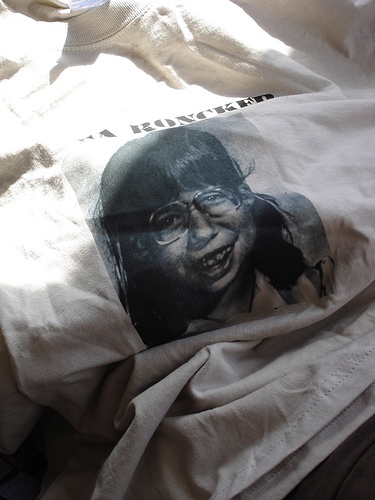 Then Lisa told me that she wore the Jessica Roncker t-shirt for Halloween. And that everyone thought I was either a serial killer or the victim of one! Which isn't weird or freaky at all. And then? Then she said that she told the people who she didn't like that I was her LITTLE DEAD COUSIN. Presumably to make them feel morbid and uncomfortable. She said that she told the people she likes who I really am. And that they want to meet me. how can i get myself a jessronckerasachild tshirt?